Speech music link shows up in babies 9 months of age. We argue that the intervention enhanced infants’ ability to extract temporal structure information and to predict future events in time, a skill affecting both music and speech processing. The intervention thus enhanced temporal structure processing not only in music, but also in speech, at 9 mo of age. We argue that the intervention enhanced infants’ ability to extract temporal structure information and to predict future events in time, a skill affecting both music and speech processing. Music and speech are complementary systems. Music and speech are complementary systems of communication expressed within a common form of energy — sound. Each system has a strength. Language is a semantically precise form whereas music facilitates social bonds and enables shared emotion. In fact music is sometimes called “the language of the emotions”. The fundamental building blocks of music are its melodies, harmonies and temporal patterns (rhythms) but both systems share a fascination for timbre. In music it is the choice of timbre that gives the first inkling of the emotion to be expressed — think of a long violin sound and you know your heartstrings will be tugged by the music that follows. Film-makers and marketers do this to us regularly. In language, it is the timbre of the speaking voice that let’s you know who’s doing the talking. Timbre, or tonal color, gives authenticity to what is said and expresses nuances well beyond the meaning of the words spoken. Think of how much we can predict about the content of a telephone conversation from the very first word spoken. Furthermore, the prosody of the most compelling forms of language, such as nursery rhymes, is proof of language’s strong connection to music’s melodies and rhythms. And to argue from the other direction, when song-writers fit words to melodies and rhythms we experience another obvious speech music link. Although we can consider speech and song as two forms of human communication both expressed and experienced as sound, we also know that they share many commonalities. The salient point is, in infancy, the attainment of speech and song arises at the same time with a particularly open window around 8-10 months. This means a great deal to us as educators. There is strong evidence that babies prefer infant-directed singing to infant-directed speech. This is the topic for another post, so stay tuned. 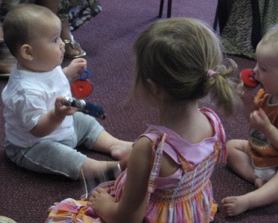 The intervention improves infants’ detection and prediction of auditory patterns, skills important to music and speech. Musical games improve prediction of auditory patterns. These 2016 findings are the first to show the speech music link in a measurable way and give us every good reason to sing to our babies and play musical games with them every day. This improves their prediction of auditory patterns. The ability to predict affects not only their music skills but their speech skills at the same time. Have a look in our store for songs to sing to babies and improve the speech music link — Songs for the very young. Inspirational stuff Carol. Really enjoying receiving your musical emails.